Update: American pastor Andrew Brunson has been released after being detained for two years in Turkey. Read more about it here. For 63 days he was detained without access to an attorney—or even a Bible. Brunson was then moved to a counter-terrorism center in Izmir and then taken to court, where he was accused of having ties to an American-based cleric, Fetullah Gulen, who is being blamed for a coup attempt in July 2016. 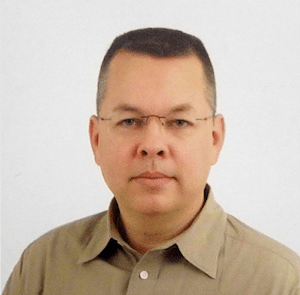 According to the American Center for Law and Justice (ACLJ), an organization representing Brunson’s family, the Turkish court had the option to deport Brunson, release him with the condition that he sign-in with local authorities weekly, or imprison him. The judge decided to keep him in prison. Brunson had been detained for more than 500 days when, earlier this month, Turkish prosecutors issued an official indictment calling for him to receive life in prison. This latest outrage has been strongly condemned by U.S. Commission on International Religious Freedom (USCIRF). Since his incarceration, several Christian organizations and 78 members of Congress have called on Turkish President Erdoğan to release Brunson. There has also been a social-media campaign that included the hashtags #freeAndrewBrunson, #SaveBrunson, and #ForgottenAmericanInTurkey. Why It Matters: When Christians in America hear of Brunson’s plight we’re naturally appalled and eager for him to be released. But there’s also a subtle, often unexpressed, attitude the Western church has toward missionaries that could cause us to forget the forgotten American in Turkey. American missionaries, like U.S. Marines, certainly know the work is dangerous when they accept their calling. But Marines have something missionaries often lack: an assurance they will not be forsaken. I’ve never been a missionary, but for 15 years I served on active duty in the Marines. From the day I joined I was taught the significance of the Marine Corps motto, “Semper fidelis”—always faithful—and that Marines “leave no man behind.” We were expected to do all that was within out power to never leave behind a comrade who was missing, wounded, or even dead. When it comes to foreign missionaries, there are two reasons the American church should adopt this “leave no man behind” attitude. First, it provides missionaries and their families working in dangerous lands with a sense of comfort and security. “It is important to note what ‘Leave No Man Behind’ means to those in uniform,” Charles Bausman says. Such a promise does not mean missionaries won’t face danger or even martyrdom. History’s greatest missionary—the apostle Paul—was in constant danger (2 Cor. 11:23-28) and was eventually killed on the mission field. But those carrying the gospel to foreign lands should know those of us at home will not leave them to face such hardships alone. The second reason is because we should follow Jesus in never leaving behind anyone that belongs to him. “If a man owns a hundred sheep, and one of them wanders away, will he not leave the ninety-nine on the hills and go to look for the one that wandered off?” Jesus asked (Matthew 18:12). We would, because we are deeply concerned about what is ours. We should have the same concern about what is his—especially when it involves a brother or sister with whom we are united in Christ. As individuals there may not be much we can do directly to save the “forgotten American in Turkey.” But as a church we should be committed to doing whatever is within our power to see Brunson returned safely. In doing so we will be sending a message to the world—the church doesn’t leave one of our own behind—and showing them what it means to be a follower of Christ.